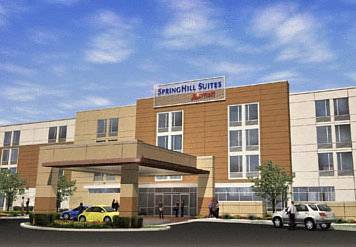 Make yourself at home at the SpringHill Suites Ewing. Settle in to one of our comfortable studio suites, offering 25% more space than comparable hotel rooms and a well-lit work area complete with an ergonomic chair. Start your morning with our free buffet breakfast and maintain your workout routine at the fitness center. Enjoy our fire pit and patio area, take a dip in the heated indoor pool, and grab a drink after work at the bar all right outside your door! Located halfway between Philadelphia and New York City, explore these cities or our own charming town. An array of dining and shopping options is within 2 miles of the hotel. Stroll the beautiful campuses of Princeton University, the College of New Jersey, and Rider University, or treat your family to an exciting day at Sesame Place or Six Flags. Business travelers will appreciate our proximity to the Carnegie Center. Whether you're visiting the Trenton, NJ area for work or pleasure, our hotel offers everything you need to relax and recharge. A ship's bell from the U.S.S. Princeton is the lone surviving artifact from an otherwise ill-fated cruise that eternally bound John and Julia Tyler. Visitors can still ring the bell. Ground Zero for Orson Welles' radio-drama "War of the Worlds" alien invasion of 1938.